The Lake Ecology and Water Quality Laboratory here at the Bella Vista Property Owners Association have mirrored techniques developed by the Kentucky Department of Fish and Wildlife to assess the overall status of fish populations in Bella Vista lakes. The goal of these techniques is to give an overall look at the health and structure of fish populations. This data is useful for our biologists, but it can also help anglers better understand our lakes and help them make decisions about where to focus their efforts. For example, some lakes might be better for harvesting many eating size fish, while other lakes might be better for trophy fish. *Please keep in mind that this analysis is still under development. New ways to rate fish populations will be added. This will mean the overall ratings explained below will change slightly. The goal of these techniques is to give an overall look at the health and structure of fish populations.Currently the analysis focuses on largemouth bass (aka LMB). The data for the analysis is collected for each lake during spring electrofishing surveys and represent the number of fish collected in one hour of electrofishing. Currently, the analysis is based on population parameters related to population size structure. In other words, the analysis focuses on how many and how big fish are. The parameters listed below are rated for each lake for each year of data based on the following table. The score of each parameter can range from 1 to 4 (1 = Poor, 2 = Fair, 3 = Good, 4 = Excellent). 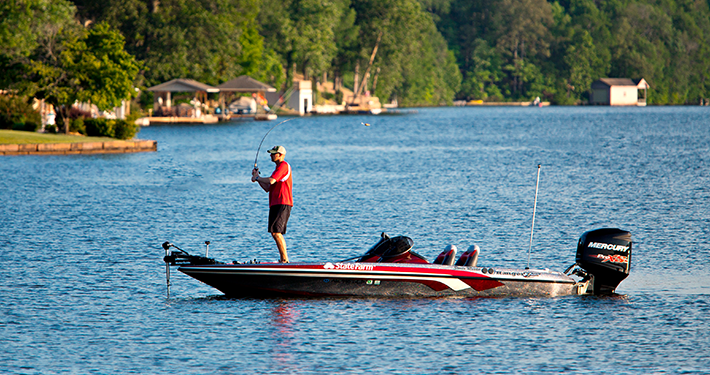 For example, if 25 bass sized 12-14.9 inches are collected per hour, it would receive a 2 or a FAIR rating. The scores of each parameter are added together to give an overall rating for the bass population in each lake for each year. The overall rating for each lake ranges from poor to excellent based on the table below. For example, if a lake had 30 12-15 inch bass, 10 15+ inch bass, and 2 20+ inch bass, it would have scores of 2 (Fair), 2 (Fair), and 3 (Good) with the sum of those three parameter scores being 7, giving an overall rating of “Fair”. 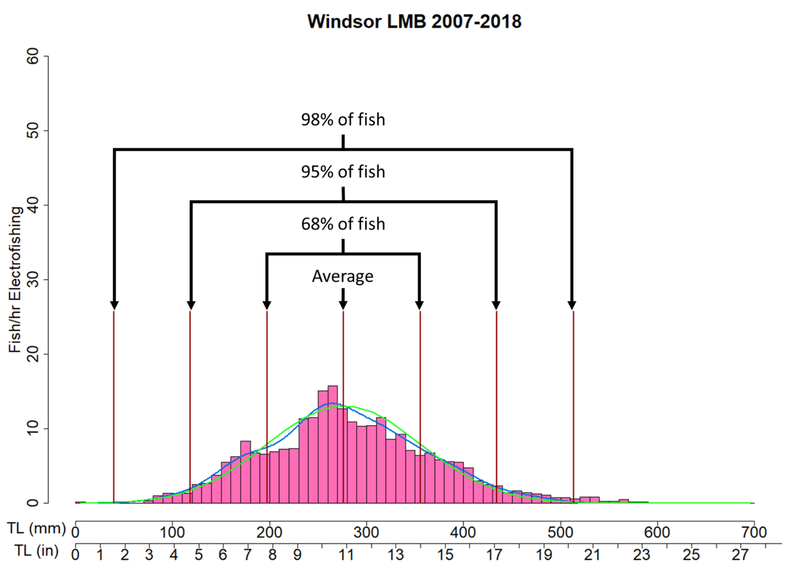 The overall rating and the rating for each parameter can be tracked across years to inform biologists and anglers about long term trends in populations. At the top of each graph is a title indicating which lake and species the graph is showing data for. The x-axis or bottom horizontal axis shows the years for which we have data. The y-axis or left-hand vertical axis shows the values of the data. For each individual size class parameter, this will be the number of fish gathered in one hour of electrofishing. For the overall rating, this will be the sum of the ratings of the individual parameters for each year. A red horizontal line through the data points indicates the average of those data points. 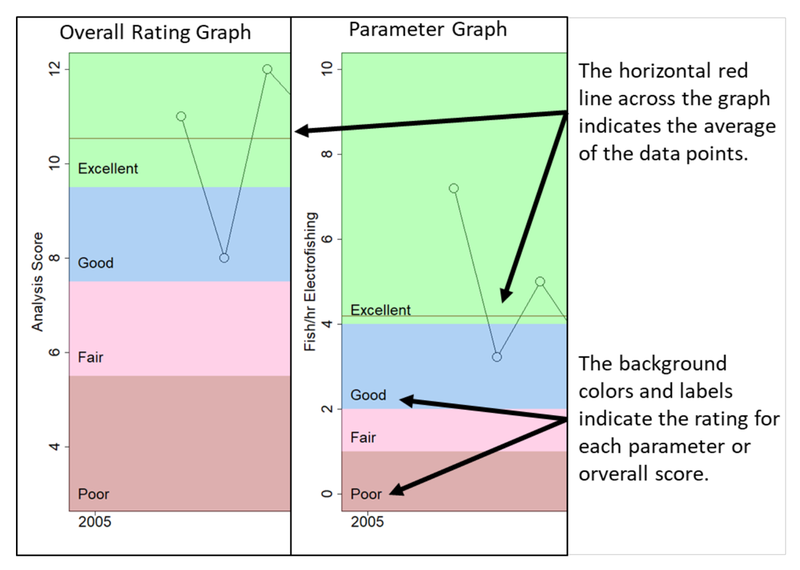 Finally, the background of the graph will be colored and labeled with the rating level. A more thorough way to look at fish populations is with a length frequency graph. This is a histogram, a type of bar graph, that shows how many fish are a particular length. These are similar to the parameter graphs above, but much more specific in size groupings and they show all sizes of fish. Each graph has a title indicating the lake, species of fish, and the year. The x-axis or bottom horizontal axis shows the length of fish in both metric (mm) and standard (inches). The y-axis or left-hand vertical axis shows the number of fish gathered in one hour of electrofishing. 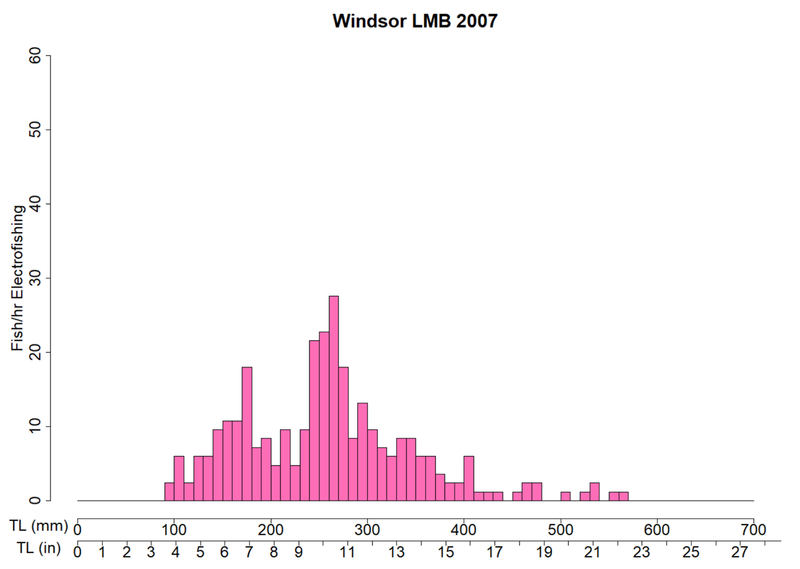 For example, in the graph below (Windsor LMB 2007), there were about 25 bass gathered in one hour that were 10 inches or 250mm in length. Composite length frequency graphs show the average length frequency over the years. This helps temper the yearly differences in sampling, for example, if we sample slightly later or earlier than is ideal. This is very useful information because it represents the typical population structure since 2007. 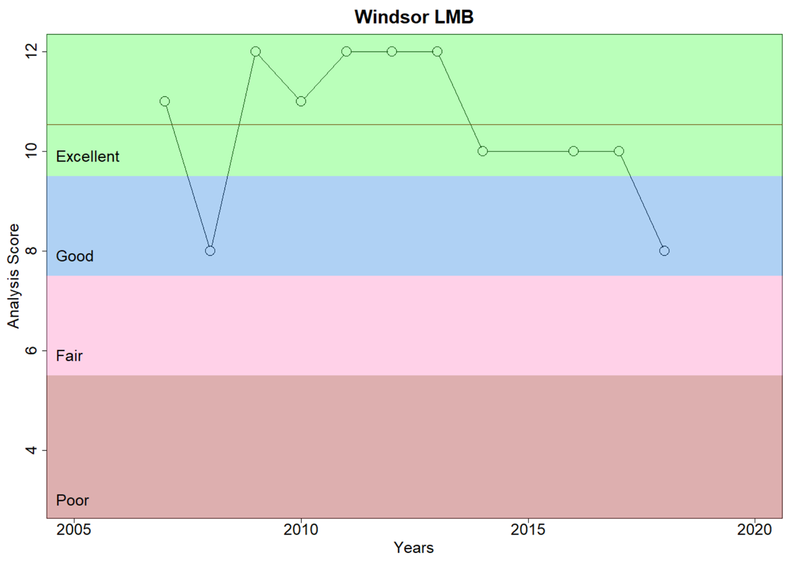 For example, in the graph below (Windsor LMB 2007-2018), there are about 15 bass gathered on average in one hour that are 10 inches or 250mm in length. There are three other features of this graph that can help with interpretation: a normal or bell curve line in green, the actual curve line of the data in blue, and standard deviation lines in red. The peak of the bell curve falls on the center standard deviation line, or the average of the data. Within one standard deviation from the average is 68% of the fish, within two standard deviations is 95%, and within three is 98%. For example, in the graph below, 68% of all fish are 8-14 inches in length, 95% are 4.5-17 inches, and 98% are 1.5-20 inches. The area under the bell curve represents these percentages. The actual curve in blue, can be compared to the bell curve line in green to see how balanced the population is.